Mean Machine 2, same super fast hull design as the original Mean Machine, but with the updated racing inspired cowl. 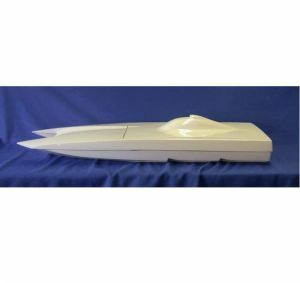 This fiberglass hull is a lightweight fiberglass with an inlaid Carbon Fiber tunnel section for added strength and rigidity. Leopard 4074 or 4082 motor. Any questions please email us for help and info.